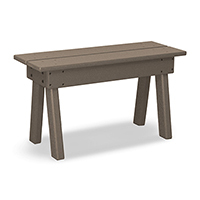 In an outdoor setting, benches are the perfect option for your home or business. Our outdoor porch and patio bench furniture is stylish, long lasting and eco-friendly. Available in a wide variety of colors and styles, you’re sure to find something that complements the personal brand of your business or commercial space. The colors will stay bright for years to come. We even offer the option of custom engraving to make whatever furniture you order special to your specific needs. Aesthetically, you won’t find better poly commercial benches for outside anywhere else! If you’re looking for long-lasting recycled plastic outdoor benches, we have everything you need. We construct the lumber used to make our furniture with naturally sourced recycled plastic. Each piece of furniture is guaranteed to last for at least 35 years without cracking, rotting, splintering or peeling. At Freedom Outdoor Furniture, we love bringing you the best furniture at affordable prices. Buy modern garden benches for sale now!